If you’ve ever watched The Longest Day, then you know the D-Day story of Sainte Mere Eglise in Normandy. Our visit, 70 years later, transported us back in time. The Longest Day with John Wayne, Eddie Albert, Henry Fonda, Richard Burton, Red Buttons, Robert Mitchum, Rod Steiger, and Bill Millim, bagpiper, as himself. 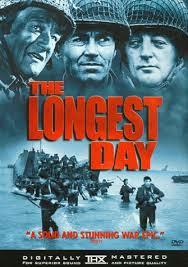 The Longest Day, written by Cornelius Ryan, is well known as the gold standard of D-Day accounts. The classic movie based upon the book, was directed by Daryl Zanuck in 1962. It is filled with famous names and faithful to its source. 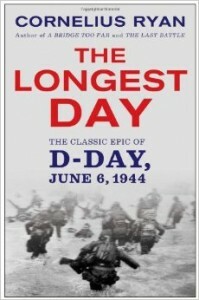 Movie or book, we’d recommend this as a must prior to visiting Normandy D-Day sites like Sainte Mere Eglise. Our Normandy D-Day tour guide, Colin McGarry, drove us to Sainte Mere Eglise after our visit to Utah Beach and Ste Marie du Mont. We can’t speak highly enough of Colin’s knowledge and expertise. It was truly a lifetime experience to visit these sites with his insightful guidance. For do-it-yourselfers, a new GPS self-guided tour device, called Open Sky Museum, has been developed by Office de Tourisme Sainte Marie Eglise. It leads visitors toward strategic and little known points of interest in a 50 km sector. The visio-guide contains personal testimonies, archives and videos. 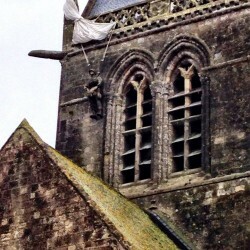 Sainte Mere Eglise can claim the title of first village liberated on D-Day by air. The 82nd Airborne’s mission to capture Sainte Mere Eglise was strategically important. The village was located on the main road between Carentan and Cherbourg, a supply and communications route for German defenders. Thus, it was vital to gain early control. Landings the night of June 5-6th, 1944 were dispersed all over Normandy’s Cotentin Peninsula. Uncertain weather conditions and changed orders had created confusion over drop zones. Paratroopers who managed to land safely lost valuable time in isolation and reconnoitering. Equipment and teams were separated from each other. However, there was corresponding confusion on the German side; because American units were dispersed it was impossible to determine where they were concentrated. Thus, the Germans could not properly assess whether this was a full-scale invasion, or a diversionary maneuver. Because German strategists mistakenly believed the invasion would occur at Calais, at the narrowest part of the English Channel, Normandy was left relatively undefended by comparison. 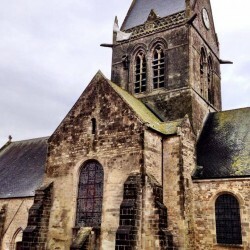 Sainte Mere Eglise was to become point zero for a group of F-Company, 505 Parachute Infantry of the 82nd Airborne. Townspeople in the village had formed a bucket brigade to save an important house which had caught fire from flares dropped by the initial Pathfinder squadron. F-Company parachutists who dropped directly over Sainte Mere Eglise were illuminated in the glare, and shot down during descent. 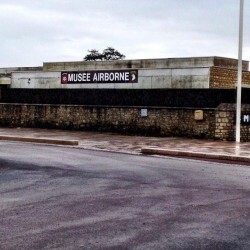 Today, the Airborne Museum is on the site of the fire, across from the Sainte Mere Eglise parish church. Today, the church maintains an effigy of paratrooper John Steele, whose parachute was caught on the steeple, leaving him to dangle helplessly for several hours while the ground fight raged below. 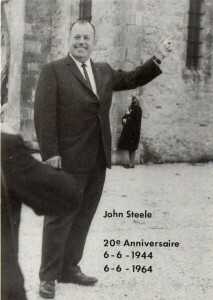 This photo shows John Steele visiting Sainte Mere Eglise on the 20th anniversary of D-Day. Steele managed to survive by pretending to be dead. He was cut down by the Germans and remained in captivity for several days thereafter. 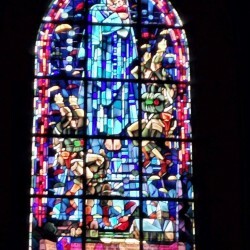 The church’s stained glass windows show the Virgin Mary with paratroopers, and St. Michael, their patron saint, with their insignias. 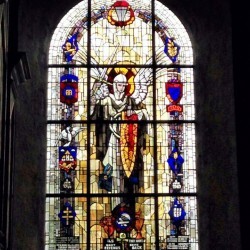 The window with the Virgin Mary was designed by the son of the mayor, whose house was burning that night. 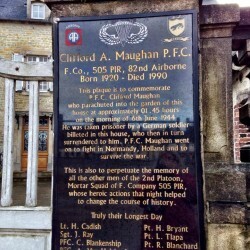 About 300 feet from the church, a plaque commemorates the actions of paratrooper Clifford A. Maughan. Maughan landed in the garden of another large house where a German officer was billeted. Taking Maughan prisoner initially, the German surrendered to him as the morning wore on and Sainte Mere Eglise was liberated. We enjoyed our guide Colin’s approach. As we encountered a certain site, he’d show us photographs from the war taken where we were standing. It was very moving to realize where we were. 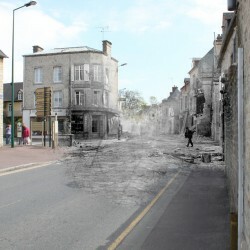 I found a superimposed photograph from the Ghosts of History site, and a contemporary photo of the church, both of which capture this feeling. 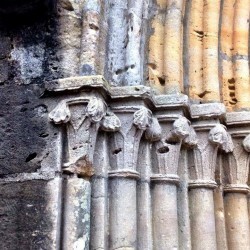 The church’s facade still displays the bullet holes from the fighting. Today, the Airborne Museum stands on the site of the burning house. 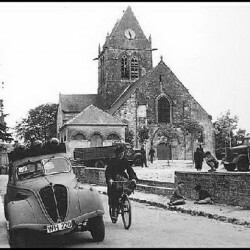 Sainte Mere Eglise was secured by American troops between 4:30 and 6AM on the morning of June 6th, 1944, cutting the Germans’ communication and access from Cherbourg to the rest of their units. Today, the center of Sainte Mere Eglise is still dominated by the church, the Airborne Museum, and other commemorative sites. We lunched at a pleasant little sandwich shop across from the church, amid the laughter of schoolchildren. If you plan to visit, there are several restaurants and inns from which you can choose. Click here for details. 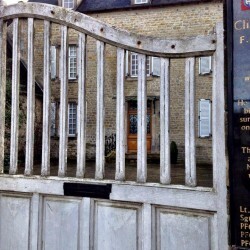 Sainte Mere Eglise is more than three hours by car from Paris. If you are taking the train, you will need to hire a taxi from the train station in Carentan. The train from Paris St Lazare station to Carentan takes about 2-1/2 hours, details here. We had purchased a Global Eurail pass prior to this trip, which we used in place of separate train fare. We did a 2 day small group tour of the landing areas with a tour group known as the Battle Bus. They closed up shop. I’m glad you found a great guide. It makes a difference there. Hi Suzanne – It does indeed. Colin intuitively knew what would interest us most. Some might balk at the expense, but the experience is priceless.